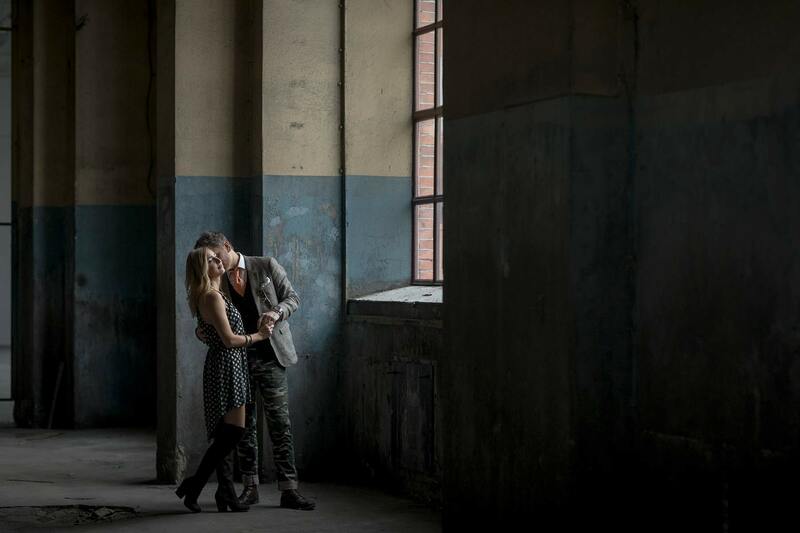 An abandoned factory adds an amazing urban feel that suits this couple’s portrait photo session perfectly. You’ve got to love the urban chic style just dripping off Sophie & Dragan, so I knew as soon as I started thinking about their couple’s photography session that I would need an alternative setting to my recent obsession with the seasonal colour changes of the great outdoors. 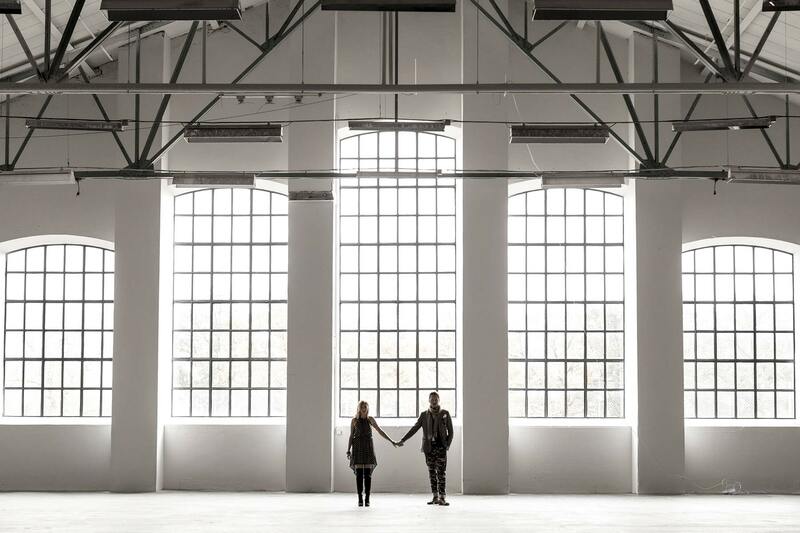 I’ve got my colleague and wedding photographer extraordinaire Lena Larsson to thank for coming up with this urban factory location. At first we were disappointed to see the space had been refurbished with the newly painted walls and smooth floors you can see in the first photograph of the couple as silhouettes against those magnificent windows, but then we discovered the space next door retained all the grungy, faded charm that I was looking for to compliment the couple’s unique style. Initially the place put me in mind of the kind of secluded spot a youthful Kevin Bacon would head to do some angry dancing in a scene from Footloose, but the photographer in me quickly saw the potential from the huge windows throwing that soft natural light onto the shabby, faded and peeling paint along with a hundred other textures. There is such depth to the pictures because of the scale, light, and contrast between the couple and the setting. I love Dragan’s unique style which is all his own, but you can at least enjoy something of Sophie’s look through her makeup work at Bare Solutions, where we first met. I’d like to thank this loving couple for allowing me to capture and show their relationship in such an intimate fashion. You can really feel the love in some of these photographs where it’s like the camera isn’t even there. Magic! Such strong imagery. Love it.